L’inverno. Time for comfort food. 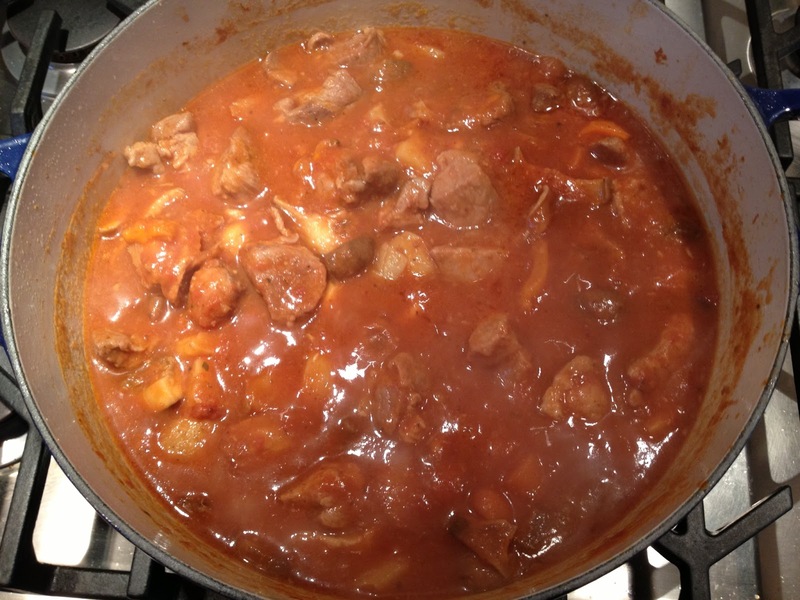 Spezzatino di Maiale is Tuscan Pork Stew, slowly braised until meltingly tender. It’s the perfect one pot meal and makes the kitchen smell wonderful all day as it slowly bubbles on the stove. The garlic cloves were purchased at a local specialty store from a gourmet “olive bar”. Otherwise, you can roast them in advance. 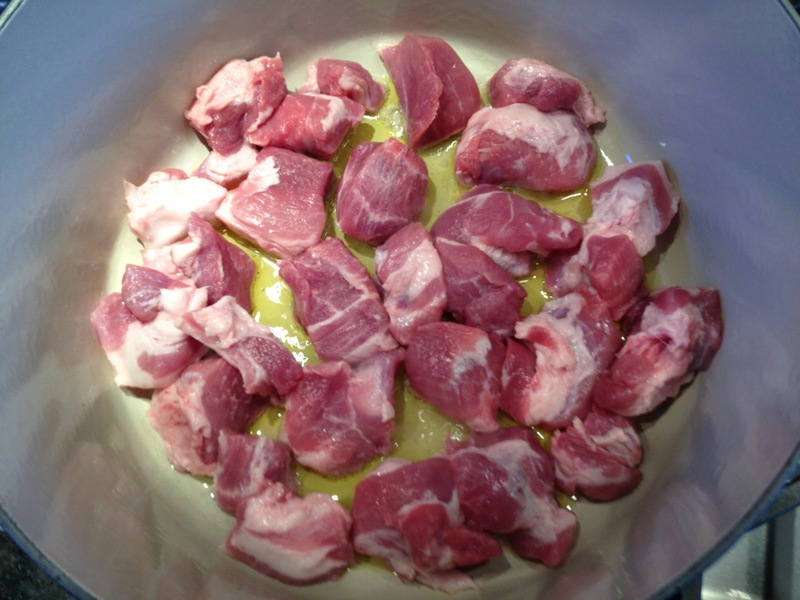 Start by browning the meat in olive oil, you will need to work in batches. As the meat gains color, remove to a platter until all the meat is browned. 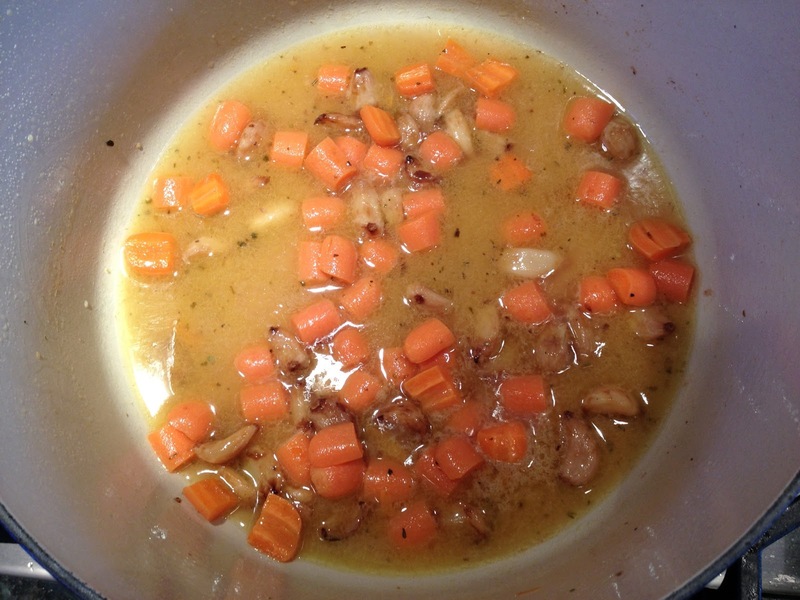 Once the meat has gained color, add the onion, carrots, and roasted garlic cloves and saute while scraping the bottom of the pot. Once these are softened, about 2-3 minutes, deglaze with some white wine. This is just after deglazing with the wine. The carrots are still very firm. 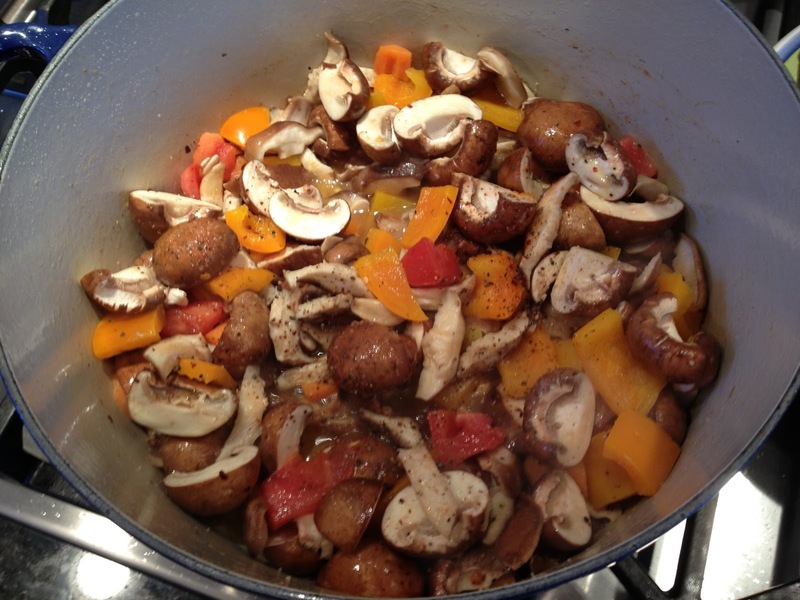 Once the base of the stew is established, I simply began adding the vegetables in this order: Pepper, the mushrooms, and then the potatoes. 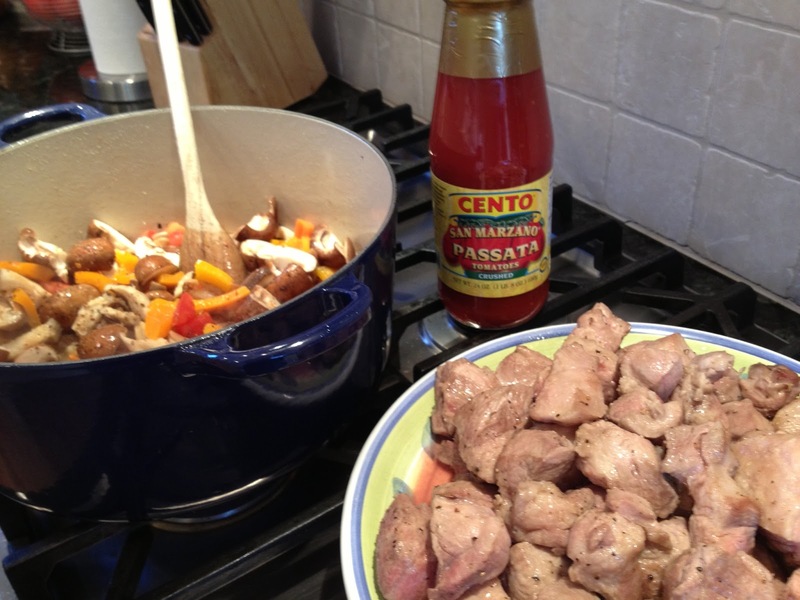 This shot shows a great new product I found – the Cento San Marzano Passata Tomatoes. Passata means “passed” or in this case, that they’ve been crushed. This is an easy way to use great tomatoes when you don’t need an entire can. As the vegetables go in, be sure to layer more seasonings. Toss to coat and you will likely to need a few extra drizzles of olive oil once the mushrooms start soaking up the liquid. The next two shots show the vegetables going into the pot, and then the addition of the wine and the tomatoes. At this point, you basically lower the flame, cover and walk away. Re-visit occasionally to stir, but if the flame is low enough, it will bubble softly and make the kitchen smell amazing. This is what it will look like after 2-3 hours. Note how much it has reduced and changed to a deeper, more earthy color. Once the potatoes are cooked through, you can add the peas. 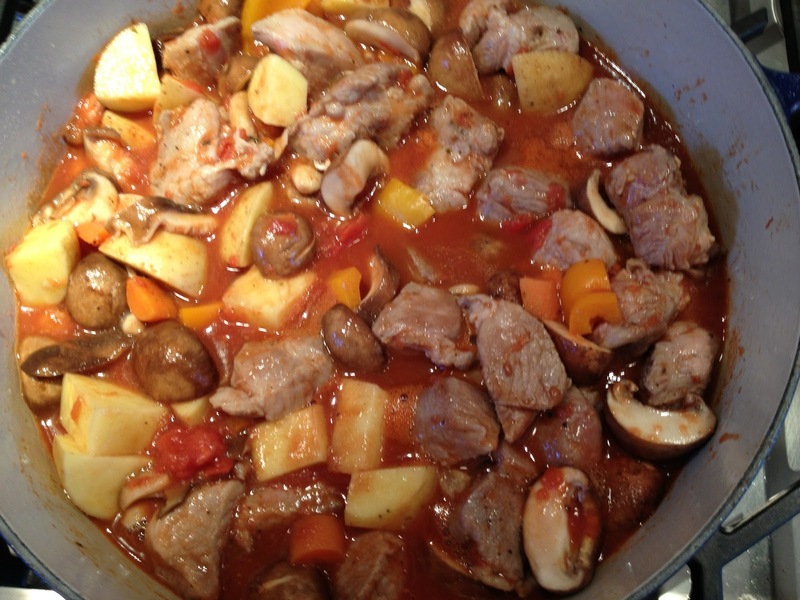 The Stew Cooked for 6-7 hours in total until it thickened on its own. 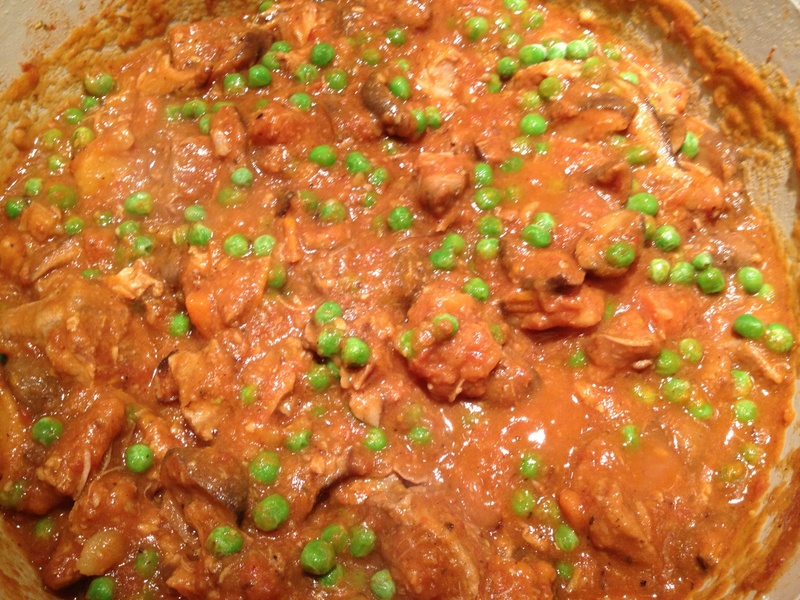 Toss the peas in just before serving – mostly for color! Delizioso! A comforting dish like the above, deserves a comforting red. 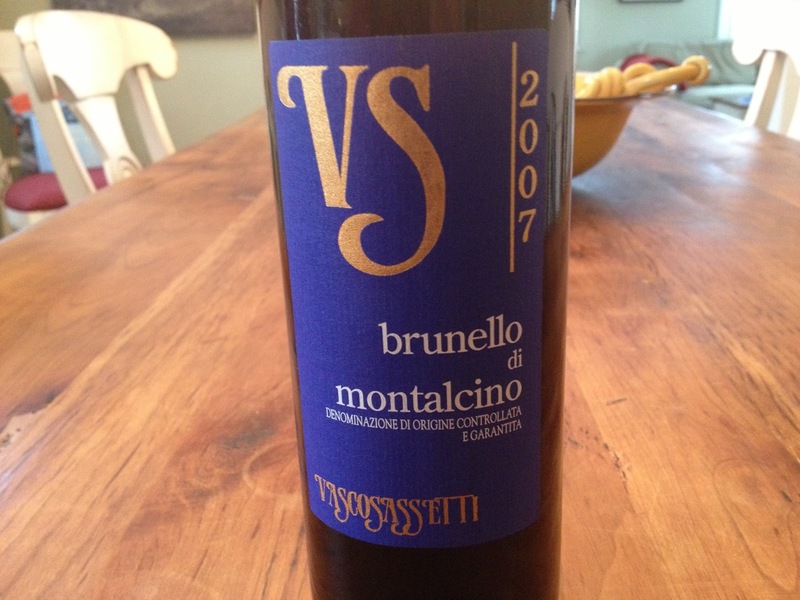 The 2007 Vasco Sassetti Brunello di Montalcino fit the bill nicely. This is the first time I’ve ever had one of Vasco’s wines. I’m a fan of Pertimali Brunello, the estate his brother Livio owns. Like many Italian brothers, the Sassetti’s fell victim to some form of familial strife and the brothers split ways to form their own estates. Having vast experience with Pertimali, I think I can say that I prefer Livio’s wines to Vasco’s – though that isn’t much of a complaint. The 2007 “VS” is a dark violet. Like his brother’s wine, this Brunello comes from the northern part of the zone and benefits from the slightly cooler temperatures. The wine is more floral, with a bit more acids. On the nose, the flowers come through as well as the cherries and spice. In the mouth the wine is soft, very alluring and sensual. It’s ripe fruit is framed by earthy notes, flowers, and fresh herbs. The fat in the pork brought the fruit out in the wine and the pairing was perfect. This is a great value in Brunello and very desirable for short term drinking. 91 points, about $32. What do you mean for "roasted garlic"